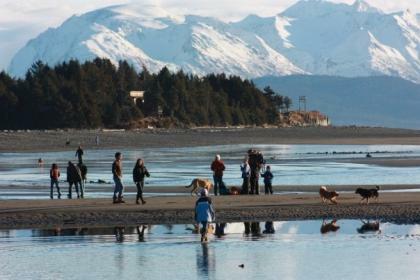 The Alaska Maritime National Wildlife Refuge is receiving multiple reports indicating a significant increase in dead and dying birds found on beaches in the Homer area over the last two weeks. The reports are coming from beach walkers and local citizen scientists dedicated to surveying sea bird populations. Leslie Slater is the Gulf of Alaska Unit Biologist for the Alaska Maritime National Wildlife Refuge. She says the number of birds reported is in the dozens. Slater says there are a lot of potential reasons for the increase in fatalities but the prevailing cause is likely tied to the birds’ food sources. These deaths don’t seem to be isolated to Homer’s beaches. There are reports of similar deaths down the Alaska Peninsula and the eastern edge of the Aleutians. Slater says it’s possible they could be related to dead whales found near Kodiak. To narrow down causes of death Slater says the refuge will send carcasses of Homer’s birds to the National Wildlife Health Center in Madison, Wisconsin. Slater expects the center to receive the carcasses by the end of this week and believes there could be a reply within two weeks. She asks that people continue to call in dead birds with the species name and specific directions to the bodies’ location. She warns the public not to touch dead birds because they could be carrying disease.